Police can stop, arrest and search citizens without reasonable suspicion or probable cause. In a 5-3 ruling in Utah v. Strieff, the U.S. Supreme Court effectively gave police a green light to embark on a fishing expedition of one’s person and property, rendering Americans completely vulnerable to the whims of any cop on the beat. Police officers can stop cars based on “anonymous” tips or for “suspicious” behavior such as having a reclined car seat or driving too carefully. In a 5-4 ruling in Navarette v. California, the U.S. Supreme Court declared that police officers can, under the guise of “reasonable suspicion,” stop cars and question drivers based solely on anonymous tips, no matter how dubious, and whether or not they themselves witnessed any troubling behavior. More recently, in State v. Howard, the Kansas Supreme Court declared that motorists who recline their car seats are guilty of suspicious behavior and can be subject to warrantless searches by police. That ruling, coupled with other court rulings upholding warrantless searches and seizures by police—for such “suspicious” behavior as having acne scars, driving with a stiff upright posture, having car windows that are too heavily tinted, driving too fast, driving too slow, failing to maintain speed, following too closely, improper lane changes, distracted driving, screeching a car’s tires, leaving a parked car door open for too long, avoiding a traffic light by driving through a parking lot, driving near a bar or on a road that has large amounts of drunk driving, driving a certain make of car (Mercedes, Grand Prix and Hummers are among the most ticketed vehicles), having anything dangling from the rearview mirror (air fresheners, handicap parking permits, toll transponders or rosaries), or displaying pro-police bumper stickers—renders one’s car a Constitution-free zone. Police officers can use lethal force in car chases without fear of lawsuits. In Plumhoff v. Rickard, the U.S. Supreme Court declared that police officers who used deadly force to terminate a car chase were immune from a lawsuit. The officers were accused of needlessly resorting to deadly force by shooting multiple times at a man and his passenger in a stopped car, killing both individuals. Police can “steal” from Americans who are innocent of any wrongdoing. In refusing to hear a challenge to Texas’ asset forfeiture law, the U.S. Supreme Court allowed Texas police to keep $201,000 in ill-gotten cash primarily on the basis that the seized cash—the proceeds of a home sale—was being transported on a highway associated with illegal drug trade, despite any proof of illegal activity by the owner. Asset forfeiture laws, which have come under intense scrutiny and criticism in recent years, allow the police to seize property “suspected” of being connected to criminal activity without having to prove the owner of the property is guilty of a criminal offense. Americans have no protection against mandatory breathalyzer tests at a police checkpoint, although mandatory blood draws violate the Fourth Amendment (Birchfield v. North Dakota). Police can also conduct sobriety and “information-seeking” checkpoints (Illinois v. Lidster and Mich. Dep’t of State Police v. Sitz). Police can forcibly take your DNA, whether or not you’ve been convicted of a crime. In Maryland v. King, a divided U.S. Supreme Court determined that a person arrested for a crime who is supposed to be presumed innocent until proven guilty must submit to forcible extraction of their DNA. Once again the Court sided with the guardians of the police state over the defenders of individual liberty in determining that DNA samples may be extracted from people arrested for “serious” offenses. While the Court claims to have made its decision based upon concerns of properly identifying criminal suspects upon arrest, what they actually did is open the door for a nationwide dragnet of suspects targeted via DNA sampling. In the ever increasing global creep toward totalitarianism, some nations are stepping up punishments for their civilians caught using social media for free speech. Now Germany is in the headlines for raiding the homes of those who the government declared had posted “offensive” content on social media. It hit the fan when it comes to free speech in Germany. Wasn’t this the country that had to fight tooth and nail to free themselves from the grip of Adolf Hitler’s censorship? It’s like some lessons are never learned. 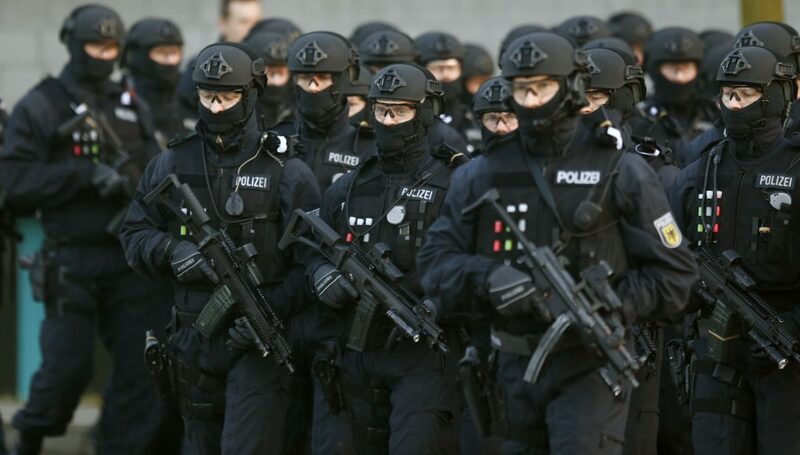 In a coordinated campaign across 14 states, the German police raided the homes of 36 people accused of hateful postings over social media, including “threats,” “coercion,” and “incitement to racism.” The goal of these raids was the confiscation of the “hate posters” Internet connection devices, according to a press release from the German federal police (BKA). Under German law, social media users are subject to a range of punishments for posting illegal material, including a prison sentence of up to five years for inciting racial hatred. Under the draft statute, networks must offer a readily available complaint process for posts that may amount to threats, hate speech, defamation, or incitement to commit a crime, among other offenses.Social media outlets would have 24 hours to delete “obviously criminal content” and a week to decide on more ambiguous cases. The law, approved by Germany’s cabinet in April, would be enforced with fines of up to $53 million. But even human rights organizations understand that all speech, even that which is disliked, is considered free speech, and any law against it is a human rights violation. Some of the posts were cruel in nature, but still free speech. According to Abendzeitung, police arrived at one man’s house in Munich at 6 am and confiscated two of his cell phones. The 23-year-old was accused of commenting that gays should hang themselves underneath a Facebook photo of two men kissing. Others were accused of making “anti-government” statements. It looks like Germany will have to relearn all the lessons they have failed. It wasn’t so long ago that they allowed the government enough power that it exterminated millions of people. But relearning these lessons will be costly at best and disastrous at worst. At crazzfiles.com you can watch a short video featuring Dr. Katelaris and make up your own mind about his sincerity, skill, and competence. Yes, even if a medicine kills you, it’s still the best that “science” can offer at the present moment. And by the way, parents have no say in how their children are treated. They have no inherent rights. The government owns those children. As proof, if health authorities don’t like what the parents are doing, they can come in and take the children away and put them in foster care, where they’ll be drugged up to their eyeballs. Medically speaking, Australia is on lockdown. The majority of citizens appear to be unaware or unconcerned. But those who are aware are looking for, and using, alternatives. They are forming a growing underground. The Australian government is advised to study the history of police states. In the long run, they fail. People will stand for only so much, particularly when their health and the health of their children are on the line. The police state appears to be invincible…until one day it isn’t, because huge numbers of people, who have been dealing with their very survival, outflank totalitarian departments and bureaus. The top-down control factor disintegrates. A belittled and minimized impulse re-emerges. It turns out that the “market” in freedom is forever. The mind never forgets it. It has now become crystal clear that the You Tube ‘Adpocalypse’ is just phase one of a far more sinister plan to sabotage successful You Tube channels in order to kill competition, robber Barron style, so that the corporate, legacy and mainstream media can yield more power, control and eyeballs on You Tube. What’s being done to the SGT Report You Tube channel can be quantified by alarming statistics which prove, the fix is in. As John D. Rockefeller famously boasted, “Competition is a sin.” Copyright Disclaimer Under Section 107 of the Copyright Act 1976, allowance is made for “fair use” for purposes such as criticism, comment, news reporting, teaching, scholarship, and research. Fair use is a use permitted by copyright statute that might otherwise be infringing. Non-profit, educational or personal use tips the balance in favor of fair use.